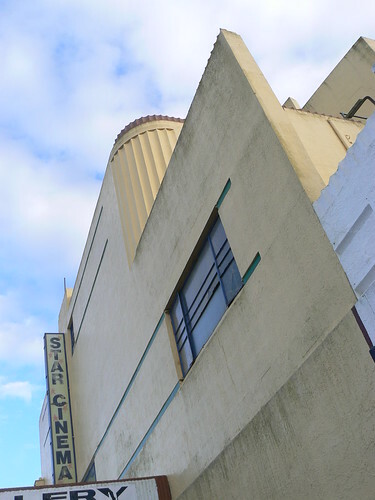 This is the Star Cinema in Portland, Victoria. 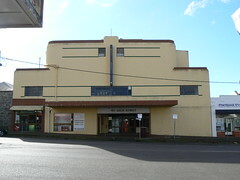 I especially like the upper floor windows in this old cinema. If you look carefully has three bars across the middle of the glass panes. You can see them better in the photo at the bottom of this article. I also like the incised lines at the top and bottom of the windows. At the two small windows at the top of the building the start at the edge of the window and proceed towards the outer walls so that they don't cross the space where the fin sits on the facade. On the other hand, the incised lines at the windows on the lower level cover almost the entire width of the building extending past the edge of the windows and seem to provide, at least visually, a base for the fin. This is my favourite kind of art deco building. The kind that remind me of big old ocean liners. I think you probably know what I mean. We are in Portland at least a couple of times each year, I'll have to take more notice. Lisa, maybe you'll get a chance to have a look inside and report back. It was closed when I was there and it wasn't that obvious in what capacity it was operating if it stil was. Yes, I'll definitely give it a try. It would be interesting to know. And I'd certainly try and get some photo's. Thanks! That's good to know, maybe next time I'll get to see inside.